I'm pretty familiar with the history of laws regarding young people and alcohol, but the introduction this weekend of new rules supposedly stopping them from starting smoking, by making twenty the mininum number of cigarettes you can now buy, legislating for plain packets and further restricting the sale of rolling tobacco, amongst other illiberal and no doubt ineffective measures, got me wondering what the equivalent history of the laws around children and tobacco is. It turns out that the Children's Act 1908 which introduced a minimum age of 5 for drinking at home and banned those under 14 from drinking in pubs (raised to 16 in 1910 and, unless it's beer, cider of wine, not spirits, consumed with a meal and purchased by an adult, 18 in 1923), also made it an offence to sell tobacco to those under 16 (raised to 18 in 2007). Not that I remember the law being enforced when I was a teenager in the 1980's and purchased cigarettes for neighbours from local shops; some of my classmates at secondary school also popped out most morning break times to buy them for their own consumption. It seems that my generation will be the last to have experienced the once ubiquitous sight of someone enjoying a fag with their pint. 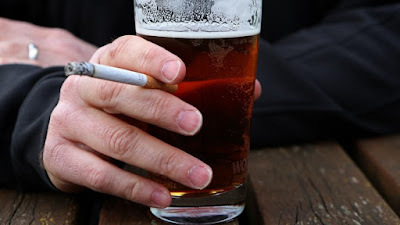 Although as a non-smoker I personally endured rather than enjoyed smoky pubs before 2007, it's hard to argue that the ban hasn't had an impact on already struggling businesses and that it was entirely a question of political ideology that a compromise, such as separate smoking rooms and exemptions for private members' clubs, wasn't found. I'm halfway through reading, admittedly rather belatedly, The Ragged Trousered Philanthropists, the socialist classic by Robert Tressell (actually Noonan, the pen name being a pun from the building trade) about a gang of housepainters in "Mugbsborough", a fictionalised Hastings, the Sussex town where he wrote the book between 1906 and 1910. 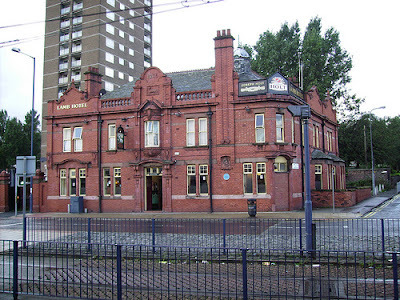 "Viewed from outside, The Cricketers' Arms was a pretentious-looking building with plate glass windows and a profusion of gilding. The pilasters were painted in imitation of different marbles and the doors grained to represent costly woods. There were panels containing painted advertisements of wines and spirits and beer, written in gold, and ornamented with gaudy colours. On the lintel over the principal entrance was inscribed in small white letters: "A. Harpy. Licensed to sell wines, spirits and malt liquors by retail to be consumed either on or off the premises". The bar was arranged in the usual way, being divided into several compartments. First there was the Saloon Bar, on the glass door of which was fixed a printed bill: "No four ale served in this bar". Next was the jug and bottle department, much appreciated by ladies who wished to indulge in a drop of gin on the quiet. There were also two small private bars, only capable of holding two or three persons, where nothing less than four pennyworth of spirits or glasses of ale at threepence were served. Finally, there was the public bar, the largest compartment of all. to refrain from using obscene language. Alongside this notice were a number of gaudily coloured bills advertising the local theatre and the music hall, and another of a travelling circus and menagerie then visiting the town and encamped on a piece of waste ground about half way on the road to Windley. The fittings behind the bar, and the counter, were of polished mahogany, with silvered plate glass at the back of the shelves. On these shelves were rows of bottles and cut glass decanters, gin, whiskey, brandy, and wines and liqueurs of different kinds." 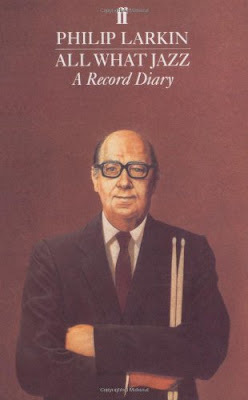 Ahead of a meeting of Manchester Jazz Society in a fortnight on Larkin About Jazz:The Poet As Critic, I've just picked up a secondhand copy of Philip Larkin's All What Jazz, a collection of the record reviews he wrote for the Daily Telegraph between 1961 and 1971. As well as being regarded as a major post-war English poet, Philip Larkin's posthumous reputation is at best that of a professional grump and commitment-phobic womaniser, and at worst that of an espouser of far-right views and composer of racist and other dubious ditties in his private letters to school and university friends such as his fellow writer and jazz fan Kingsley Amis. Like Amis, Larkin's jazz tastes were for the New Orleans and swing bands of his youth, Armstrong, Bechet, Ellington and Basie, and he expresses his aversion to modern jazz, especially its leading proponents Charlie Parker ("compulsively fast and showy...His tone, though much better than that of his successors, was thin and sometimes shrill"), Thelonious Monk ("his faux-naif elephant-dance piano style, with its gawky intervals and absence of swing, was made doubly tedious by his limited repertoire"), Miles Davis ("Davis had several manners: the dead muzzled slow stuff, the sour yelping fast stuff and the sonorous theatrical arranged stuff, and I disliked them all") and John Coltrane ("metallic and passionless...exercises in gigantic absurdity...long-winded and portentous demonstrations of religiosity"), in the introduction to this collection, although he does moderate his opinions of them to some extent in later reviews, even going so far as to half-heartedly praise the free jazz musician Ornette Coleman ("a slow ballad that sounds as if it is trying to be beautiful"). Larkin's love of the blues is unsurprising, but what did come as a bit of a shock is that as well as interwar figures like Bessie Smith, Big Maceo and Big Bill Broonzy his tastes also extended to the postwar Chicago electric blues bands of Muddy Waters, Little Walter, James Cotton, Howlin' Wolf and Big Walter Horton with their amplified guitars and harmonicas, the rediscovered Mississippi bluesman Fred McDowell and his protege R.L. Burnside, Texas acoustic guitarist Lightnin' Hopkins, swamp blues duo Lightnin' Slim and Lazy Lester, the late sixties soul-blues of Nina Simone and even black Cajun R&B/zydeco accordionist Clifton Chenier.